Your offer depends a lot on your practice and the type of new patients you would like. Do you have a lot of cash patients, insurance, or both? What other services do you offer like Massage, Physical Therapy, Functional Medicine, Weight loss, Laser Therapy, Acupuncture, Pain Management, Injections, etc…? Do you have any consumable products like bio freeze, cervical pillows, Vitamins, etc…? 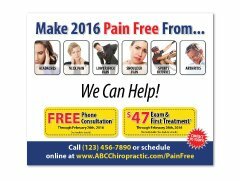 Are you an optimal health practice, come in when you’re in pain practice, wellness clinic, PI based practice? I will outline some general types of offers that work nationally for different types of practices and in different markets of both extremely affluent and lower income. The biggest mistake chiropractors and other marketing firms make in Chiropractic Marketing is they expect the ad to sell the patient. The true goal of chiropractic marketing is to get people to respond and you “Sell” them in the practice where you can actually overcome their rebuttals, answer their specific questions and concerns and show them how you can treat their pain / symptom / ailment. An attractive offer will wet someone’s appetite so that they respond. To draw Insurance Patients you have to first realize that they are not as worried about a discounted rate. They are going to be most concerned about not having to pay anything beyond what their insurance covers, paying their deductible, if you accept their specific type of insurance, and how many visits they will be covered for. What motivates insurance patients to respond is something they receive that their insurance doesn’t cover. The purpose is to attract patients that don’t have to pay much or anything out of pocket but still get their attention by offering more than just what their insurance covers. For instance: Most people understand and like massage, therefore offering a “FREE Massage after a completed Exam, X-ray & First Treatment”, is a great offer for a patient with insurance. Other such offers would include: “Free bottle of BioFreeze (or other consumable product) after your paid in full Exam & X-rays” or “Free Laser treatment after a Pain Relief Exam & First Treatment”. A lot of people are unaware if their insurance covers Chiropractic care. A lot of existing patients are not aware of how much benefits they have remaining. Therefore offering a Free “Insurance Verification & Benefit Summary” is a great way to make buying easier for both new patients and existing. For patients that will be footing the bill (Cash Pay), it always helps to remove or reduce the initial barrier to entry. If you read the Millionaire Next Door, you will see how everyone likes a deal regardless of how much money they have. A big concern here from doctors is they “don’t want tire kickers.” I completely understand, but it is far better to have 20 people respond and you then convert 12 people into good patients, than to have 2 people respond and maybe convert 1. Good offers that motivate cash pay patients are those that have a discounted rate or a really low barrier and SHOW the normal price. This includes such offers as: “FREE EXAM (Normally $80)”, “Free Massage after a completed New Patient Exam”, “Free Massage (buy 1 get 1 free)”, “$17 Initial Exam”, “$47 Exam, X-ray and First treatment (Normally $280)”, “$7 Pain Relief Evaluation (Normally $49)”. It is important to realize that people are very busy and if they are not “sold” on the idea that you can help them they are not going to respond to your offer regardless of cost. For a lot of patients their time is worth more than the cost. Offering a “FREE Phone Consultation” allows prospective patients to call and learn more about how you can help them. This no commitment offer removes their barrier of investing the time required for an appointment. This is a great way for you and your staff to close more deals and sell patients on the advantages of chiropractic care and convert them to patients by building trust and confidence during the phone consultation. The race to get personal injury patients in the door is aggressive. The offer is very important as well is timing of your marketing, educating patients on why to see a chiropractor and frequency. 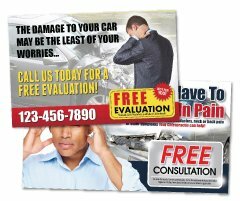 To attract more auto accident or personal injury patients from your marketing, your offers should be “Free Auto Accident Evaluation”, “Free Massage after a Free Auto Accident Evaluation”, offer “Free Transportation to the appointment”, provide a “Free service or product after completing a Free Auto Accident Evaluation”, and/or “Free Insurance verification”. The offers should stand out but most important is to reach each prospective patient three times and make your offer attractive to take away any barriers. Including the “FREE Phone Consultation” is extremely effective for PI patients who are already suffering from an overload of stress and lack of time. You can empathize, provide solutions to many of their auto accident problems and explain the importance of being evaluated. As important as offers are, they only work if patients are able to take advantage of them. That means someone needs to be answering your phone from 7am-7pm and you must have a clean and easy to navigate landing page on your website where they can claim the offers and schedule an appointment. Look for upcoming Chiropractic Marketing tips about how to implement landing pages, how to assure your phone is always answered, reaching the affluent and value of a discount or to be notified, sign up by entering your email address to the left. Whenever we design a chiropractic marketing campaign for you whether it is reactivation, new patient marketing, referrals, auto accident marketing, Chiropractic Postcards, on your web site, landing page, any type of print, flyers, brochures, posters, or personal injury marketing, we ALWAYS make sure you have the best offer to reach your goals and convert patients. To do this we analyze your practice, your goals, the demographic around your practice, your services and provide recommended offers that are sure to attract patients and guarantee a successful campaign!